Selling jewelry can be a profitable endeavor, with Antique Estate and Fine Gold & Silver vintage pieces being in high demand and valuable. However, damaged or outdated Gold & Silver Jewelry pieces may be worth very little other than their scrap value. All Things Antiques and Collectibles in Rochester, NY, has been appraising, buying, and selling jewelry and other valuables for 20 years. Here, the staff offers a few tips that can make your next jewelry sale easier. The maker, condition and weight are the biggest factors in determining the price of vintage jewelry. Often, damaged and outdated pieces are only valued for their metal and stones whereas high end makers like Tiffany & Cartier can add significant value. The Jewelry is first determined to be a certain Karat of Gold or Silver by its markings. 9K, 10K, 14K, 18K, 22K or Pure. 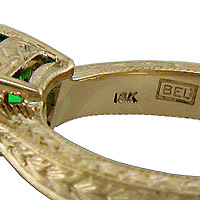 The higher the Karat the more value the item of Jewelry will have based on its weight. The Jewelry is then weighed in Pennyweight (DWT) or Grams to calculate its value. The jewelry industry has been recycling metal and gems for thousands of years. Pieces that are damaged beyond repair are valued at their intrinsic worth, meaning it is worth the price of the metal and stones they contain. Some Gold & Silver jewelry styles that are outdated and unfashionable are also valued this way. Certain grades of Antique & Vintage Costume Jewelry can also have collectible value based on its age and quality but not like weighing a gold ring for its gold value. Some jewelry styles are timeless, while others fall out of favor as quickly as they come. Knowing what’s popular will help you determine which of your pieces are likely to sell for more than its scrap value. Haute Couture and antique jewelry are classic categories that always find a buyer. Oversized cocktail rings and men’s styles are also not all that popular and not easy to resell. For professional jewelry and antique appraisals and sales, visit the experts at All Things Antiques and Collectibles. Whether you’re selling Fine Gold Estate Jewelry, Fine Gold & Silver Jewelry, Vintage Costume Jewelry or an estate lot of gold and silver coins, they’ll ensure you get top dollar for your valuables. Call (585) 647-9320 to speak with one of their helpful staff members or visit their website for more information. 5 of the Most Valuable Coins in the U.S.
How Much Is Your Old Pocket Watch or Wristwatch Worth?